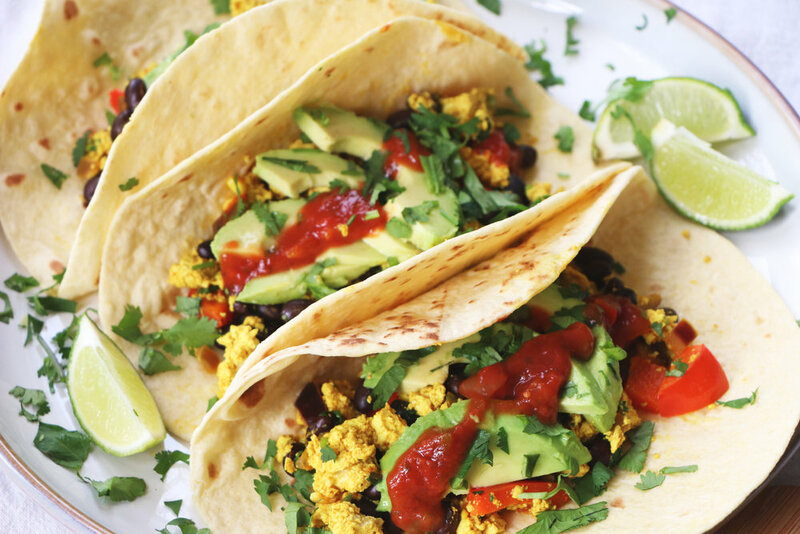 If you're not a sweet breakfast fan, these tofu tacos are the perfect option for you. Chop your onion and garlic, adding to a pan along with a drizzle of olive oil, over medium to high heat. Fry until soft. Slice your red pepper, drain the tofu, and drain and rinse your black beans. When the onion and garlic are cooked, add in the spices to the pan and stir. Add a dash of water if it needs it. Add in the pepper and crumble in the tofu with your hands. Stir through until everything is thoroughly mixed, and add the soy sauce and black beans. Chop the coriander, adding the stalks to the pan and saving the leaves for topping. Keep stirring the scramble as it cooks (5-10 mins). Prepare your toppings: heat the tortilla wraps in the microwave or oven, slice up your avocado and lime. When the tofu scramble is cooked, spoon into the wraps, topping with avocado, coriander, a dollop of salsa, and a squeeze of lime. I don't bother pressing tofu if I am using it for scramble, as it doesn't need to hold its shape. The excess water will evaporate off as you cook it. While this is technically a breakfast recipe, I think it's perfect for brunch at the weekend, lunch or dinner. This tofu scramble would also taste delicious with a side of crispy potatoes.